Anxiousness…not an emotion you want to feel unless you’re like Charles Darwin in 1835. In a letter to his sister, he stated, “I am very anxious for the Galápagos Islands. I think both the geology and the zoology cannot fail to be very interesting.” Ah yes, he was right except we don’t want you to feel anxious about organizing your vacation, which is why we’ve taken care of all the details for you. On this 8-day vacation, we’ve arranged your hotel and cruise accommodations, sightseeing, and most meals. Plus, you’ll have access to a Local Host® in Quito, someone who will help you personalize your trip, answer questions, and generally be there for you. Your vacation starts the moment you arrive in Quito. We can pick you up at the airport and seamlessly take you to your selected hotel, where your Local Host will give you a warm welcome and materials to prepare you for your trip. The next day, after an included breakfast, we’ll pick you up at your hotel for a private tour of the city with a local expert. Hear the fascinating stories and little-known facts as you visit must-see sights like Independence Square, San Francisco Plaza Church, and the Basilica. You’ll also have free time to explore. Perhaps ask your Local Host to arrange an excursion to the Middle of the World (latitude 0), where you can have a foot in each hemisphere, or take a ride on the highest cableway in South America and see amazing views of the city. 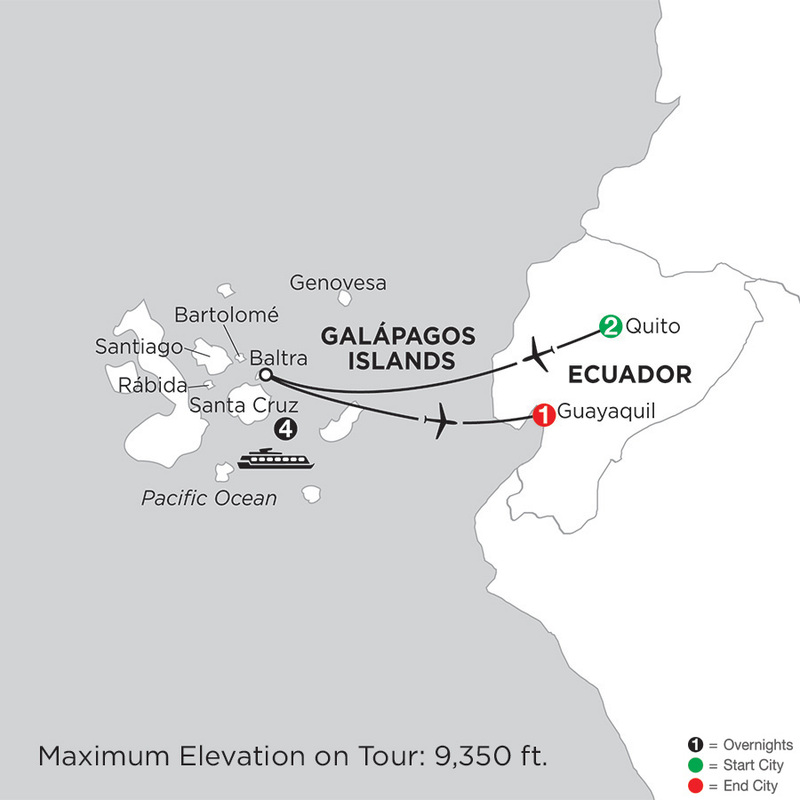 Then you’re off to the Galápagos Islands, where your cruise ship is waiting. On your 5-day cruise aboard the Santa Cruz II, all your meals are included. You’ll visit Santa Cruz Island, with a white-sand beach and brackish lagoons that serve as feeding grounds for various wading birds; Santiago Island, home to marine iguanas, Galápagos finches, flamingos, sea lions, and a common nesting area for sea turtles; Puerto Egas, known for its black-sand beach, land and marine birds, marine iguanas, and a colony of fur seals; Rábida Island, with its red-colored beach and large colonies of sea lions, marine iguanas, mockingbirds, yellow warblers, and Darwin’s finches; Bartolomé Island, where you’ll hike to the summit for a spectacular view of two beautiful bays and fascinating formations of lava flows; Genovesa Island, where you’ll take a panga ride along the cliffs to see the shore and seabirds nesting on the cliffs’ ledges, and where you’ll climb up Prince Phillip’s Steps to see masked boobies, blue and red-footed boobies, frigatebirds, and more; and finally on Santa Cruz Island, visit a Tortoise Reserve to see the Giant Galápagos Tortoises living in the wild. Throughout the cruise, you’ll have the opportunity to swim and snorkel. Sometimes you may even be escorted by marine turtles! Throughout your cruise, you’ll be with an expert Naturalist who will bring this destination to life and be able to answer any question you may have. Our goal is to help make this magical experience a reality! That’s why we’ve put together this vacation for you that includes sightseeing, hotels, cruise, transportation, most meals, and guides and Naturalists. That doesn’t even include the cost of your time or your sanity planning it all on your own! Let us handle the details while you grab your camera and swimsuit…the Galápagos Islands are waiting! On this vacation, you’ll cruise aboard the Santa Cruz II, renowned for its amenities, excellent service, and onboard Naturalists. When you’re not on the islands, enjoy the ship’s bar, Jacuzzi, observation platform for dolphin and whale watching, and well-stocked library.